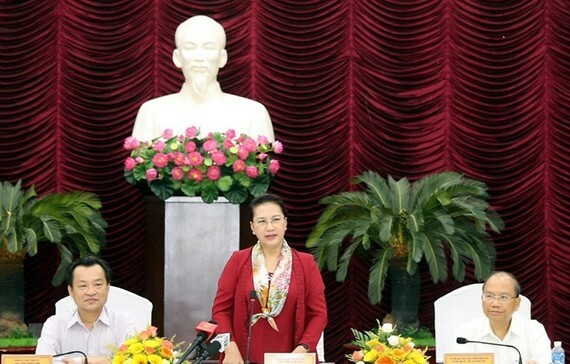 National Assembly Chairwoman Nguyen Thi Kim Ngan held a working session with authorities of south central Binh Thuan province on March 16 to discuss socio-economic situation, Party building and key tasks for the near future. As a trade gateway to the southeast and the Central Highlands, Binh Thuan posted annual growth of 8.08 percent in gross regional domestic product last year. Its agro-forestry-fisheries accounted for 30.8 percent, industry-construction slightly moved up to 31 percent and services 38.1 percent. NA asked Binh Thuan to fully tap its 192km coastline and beautiful beaches in service of socio-economic development. She also lauded the provincial authorities and people for their achievements in Party building and serious implementation of the Party Central Committee’s directions and resolutions over the past years. Due to overlapping planning on urban development, energy, tourism, agro-forestry, the province found it difficult to approve a number of economic projects. It plans to launch three tourism projects but most of land for them are in titan reserve area. In response to the issue, the top legislator asked the NA General Secretary and the NA Committee on Science, Technology and Environment to monitor and deal with it in accordance with conclusions by Deputy Prime Minister Trinh Dinh Dung. About ash, cinder and environment treatment at Vinh Tan Power Centre, she said the legislature will oversee ministries’ compliance with legal regulations, national standards and technical guidance on ash and cinder treatment till 2020, as well as offer incentives on technology and funding for the effort. According to her, the NA will also monitor the implementation of the Phan Thiet airport project, including feasibility report and design approval. The leader also agreed with the need to build Ka Pet water reservoir to store water during rainy season and provide it for agricultural and industrial production, and local lives, especially amid climate change at present. As regards the locality’s suggestion to launch the La Nga 3 lake project to meet demand for agriculture, local uses, industry, tourism and power supply in the province and nearby localities, she requested adding the issue to question-and-answer sessions at the NA’s upcoming seventh session in May for consideration. Hailing the province for having 61 percent of communes recognised as new-style rural areas, Chairwoman Ngan urged further attention to new rural development, switch to crop and animal farming in adaptation with climate change, and social welfare for citizens. 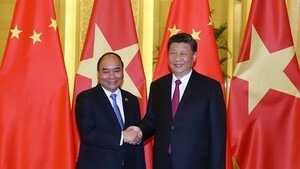 Secretary of the provincial Party Committee and Chairman of the provincial People’s Committee Nguyen Manh Hung pledged to fix shortcomings in socio-economic development, improve local economic competitiveness, and reform activities of Vietnam Fatherland Front chapter and socio-political organisations. Earlier in the afternoon the same day, Ngan visited and presented gifts to two heroic Vietnamese mothers in Tan Nghia township and Ham My commune.